There’s something to be said about the 1950s science-fiction film. Their plots may have been coldly focused on issues of the time, lending them all an imitative air, but the acting and scripts, for the most part, never went for the easy laughs. In recent years the Mystery Science Theater crowd has taken several of these movies, usually ones with subpar stories and acting, and turned them into victims of mockery. 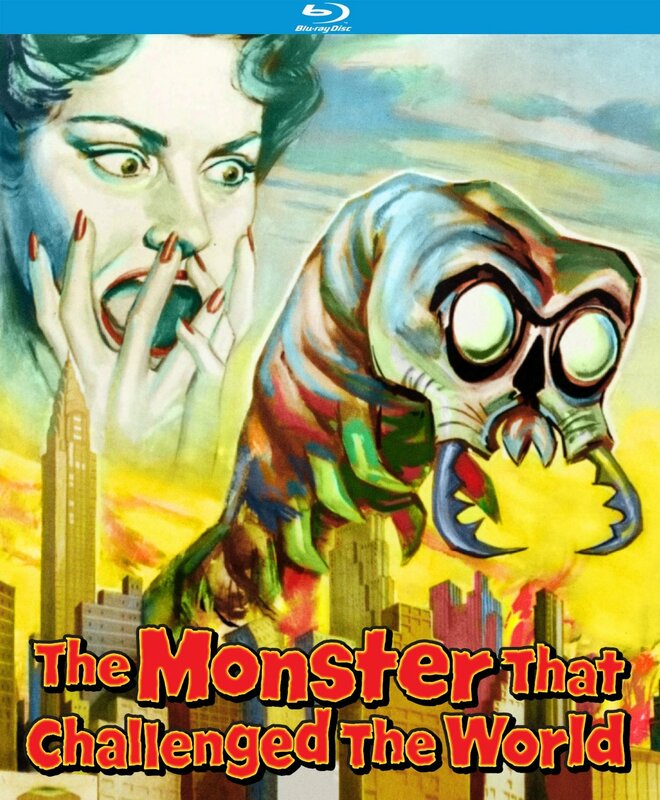 It’s why The Monster That Challenged the World is so refreshing because the story is just zany enough to be laughable and engaging, the acting is all first-rate for the genre, and while you could see the MST3K gang making fun of it, it works far too well on its own merits. This is a piece of popcorn entertainment, bar none, and Kino’s downright gorgeous restoration makes it worth watching with friends and laughing with. When an underwater earthquake in the Salton Sea unearths monstrous giant mollusks, a Naval base and its crew will have to stop them before they overtake the world. The title’s fairly self-explanatory although there’s never any doubt that the monster will challenge California, let alone the entire world. Director Arnold Lavan was better known as a prolific director of television, emphasizes characters above all else, because if you don’t know who the people are, you won’t care when they’re put in mortal danger. Western star Tim Holt plays our hero, Lt. Comdr. John Twillinger, while Audrey Dalton plays love interest Gail MacKenzie (she comes complete with a cherubic little girl who never seems to be at school), and voice actor Hans Conreid is scientist Dr. Jess Rogers. (Conreid is best remembered as the voice of Captain Hook in Disney’s Peter Pan.) Be sure to look for character actor Max Showalter as Dr. Tad Johns. All of them play their scenes straight, without winking or mugging for the camera. The dialogue isn’t too schlocky, though you will get the occasion, “NO….NO…..NO” as a walking corpse stands there waiting for the monster to catch up and engulf him. But, for the most part, these are all average Americans just nice enough for us to want them to avoid peril. The characters are all faithful sci-fi archetypes: the hero, the girl, the scientist, but slight deviations from the formula keep them interesting. Dalton’s Gail is a single mother after the death of her husband. When one of the scientists, killed off by the creature, leaves behind a wife “in the family way,” Gail sympathizes with her, and actually feels bad going on a date when she could be supporting her friend! Unlike most 1950s sci-fi films heavily steeped in questioning Communism and conformity, the deeper themes of The Monster That Challenged the World – if there are any – aren’t immediately evident. Of course it takes place in California, scene of sunshine, happiness, and Hollywood. The Salton Sea Naval base is funny for myself as a native Californian. The monster would have nowhere to hide in our current drought, then again he picks the saltiest sea in the state. Like films of the era, though, we are given the requisite documentary voice-over, introducing the events taking place on “one more routine” day. The actual catastrophic earthquake looks to barely register for the various soldiers on the base, but that’s unimportant. A trip to the local hall of records, overseen by the a creepy curator/shut-in, brings up questions of government bureaucracy; the records aren’t organized because the government didn’t approve room for expansion. This is probably the only deep-seated political message the film has. The actual creature looks less like a mollusk and more like the love child between the Tingler, the alien from Independence Day, and E.T. The video footage of real mollusks and slugs acting normal is scarier than the monster here, but that’s probably because I’ve never watched a slug up-close. Wow, those things are gross! There are some hilariously cheesy practical effects when the monster grabs people. The weird face masks for the victims all look like the same mold, complete with big bulging mannequin eyes. A similar tale of an underwater menace, albeit with greater name recognition, is The Creature From the Black Lagoon (1954), and Lavan takes a few pages out of Universal’s playbook for this. There’s some fun underwater photography of the scientists scuba diving into the now cavernous sea, with the creature lying in wait. It’s evident that the close-ups are shot in a studio tank, and there was probably only one take, but the practicality of it all (coupled with all the practical effects in the film) give off an air of tangibility. These characters are interacting with something, even if it’s got the believability of Saturday Night Live’s Land Shark. Speaking of, it’s never asserted that the creature can walk on land, so it leads to funny moments with the police circling the beaches in choreographed patters, just waiting for the monster to mysterious appear. All of this will sound like turn-offs to those who don’t enjoy cheesy 1950s sci-fi. For me, it’s like going to Disneyland; it’s dated and the machinery is evident, but you can’t help but be swept away by the entertainment of it all. The actors are all capable and aid your purchase of the premise, and the script doesn’t treat the audience like idiots nor does it presume it’s a slam-dunk narrative. Kino’s new transfer is utterly exquisite, beautifully restored, free of grain, and wonderfully detailed. The Monster That Challenged the World will be playing at my Halloween party this year, for sure!